I'm not sure how exciting and/or interesting this whole renovation may be to some of you, but considering it has been the complete and utter bane of Tom and my existence for the last two months, it's getting covered here quite a bit. I hope you enjoy it, but if not, you can rest easy on the fact that we are nearly done! Trust me, that comes as more of a relief to me than it does to you - hahaha! We have learned so much from this process and there are plenty of snippets of wisdom regarding a DIY renovation that I'll be sharing with you all soon. Seriously. We've learned some really weird things about renovating that no one ever warns you about. So stay tuned for some words of wisdom! Today though, I thought I'd give you an update on our progress. This will be the last update (most likely) until the final reveal... but that won't come until July because we're waiting to hit the 4th of July sales for our new appliances. We got tempted by the Memorial Day sales, but we know the July round will be better. Not to mention, we've gotten pretty dang good about being patient. Two months without a kitchen sink or oven will do that to you. See? Wisdom. 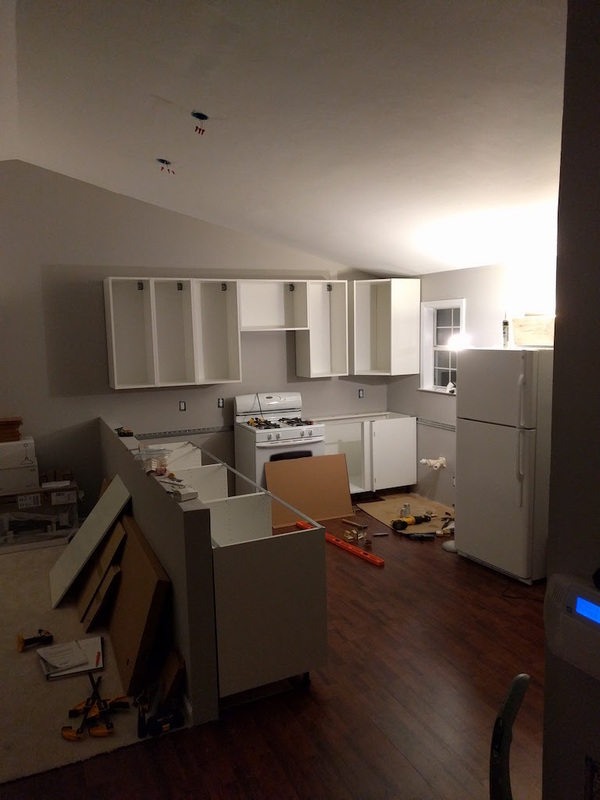 In my last update, we had successfully managed the demolition, electrical, and were patching up the drywall. 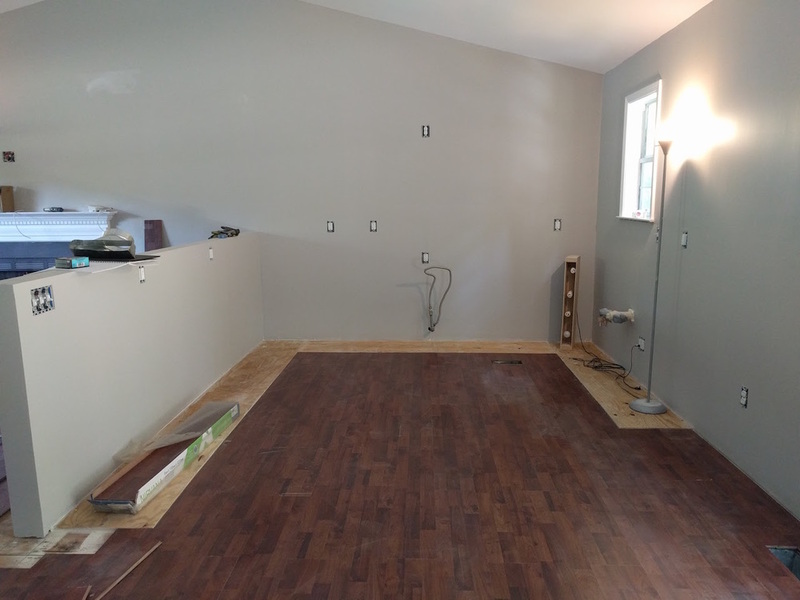 You could make out the faint outline of a kitchen, but since then, we have made leaps and bounds. If I'm being honest, where I left off in my last update is about when we started to feel the burn of renovation life. We were tired of it, and it seemed like we hadn't gotten anywhere. But. About a week later, we finally started to feel the down hill speed picking up and have been trucking along ever since. I tried to group the photos in "fours" of the same angle taken over the last month. Basically what you're seeing in terms of stages are: patched, sanded, painted, and current status. It's truly amazing how important the seemingly little things are in a functioning kitchen. 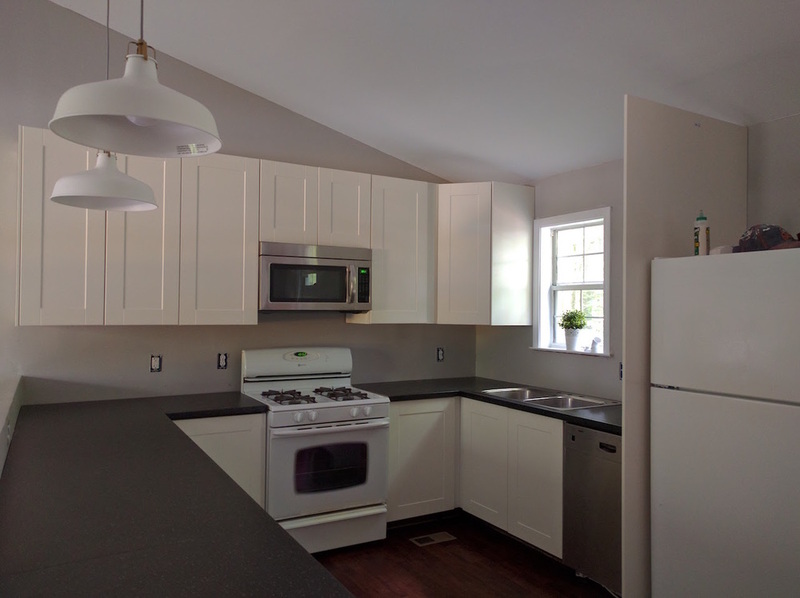 We still have toe-kicks, faucets, outlet and switch covers, more lighting, a backsplash, new appliances, door/drawer handles, finishing touches on the counters, a pantry and fridge cabinet to assemble and install, shelves to place in cabinets, and more. So as close as it might seem, there is still plenty to be done. But heck, I'm just thankful I could actually bake a frozen pizza in a REAL oven last night. Praise Jesus. Anyways, enjoy the progress photos and see below for links to a few products (lights, paint colors, etc..). What do you think? We are soooo ready to have a couch in our home again and a TV on the wall. And maybe a few bottles of wine.... each. But hey, it's been totally worth it, who am I kidding? Any questions? Drop me a comment or contact me!